Services were held in the Gymnasium from the opening of the camp and then transferred to the C. of E. Soldiers Institute, when their new hall was built in 1906. In February 1921 St. George's Garrison Church was erected in Budds Lane, where a plaque now marks the spot. The organ and many of the church furnishings came from the Army depot at the Curragh after Southern Ireland became a Republic in 1907. 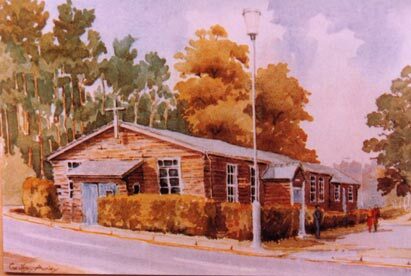 The most treasured and impressive possession of the church was the Reredos, which is a memorial to all units who have served in Bordon and was dedicated in 22 nd July 1964 by the Chaplain General, the Venerable I.D.Neill, CB OBE MA, Chaplain to the Queen. The Memorial is in the form of a large painting. It shows the central figure of Christ standing on a mound, with four uniformed kneeling figures dressed and armed in the style of the South African War, the First and Second World Wars and Korean War, with a Chaplain standing giving the blessing. In the background are depicted all the Arms and Corps, who have served in Bordon. This magnificent painting was executed by the then unknown artist David Shepherd. Half of the 1,000 Pounds cost of the painting was subscribed by units and other bodies, who had connections with the camp, and half by HQ Bordon Garrison. 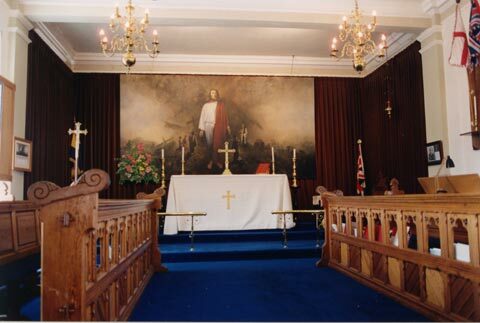 The Reredos is the property of St. George's Garrison Church and the Chaplain General for the time being, but in the event of there being no Garrison Church in Bordon at some future date, then the Reredos becomes the property of the Royal Army Chaplains Department Depot. The copyright of the painting is vested in the owner i.e. St. George's Church and the Chaplain General, subject to the approval of the artist to any reproduction being made. In 1983, the Church, known as the Tin Tabernacle, in Budds Lane was demolished and the contents transferred to a building in Station Road, which started life as the R.A. Institute in 1906. The church is situated on the ground floor with rooms for the Chaplain behind, and a reception room on the first floor. 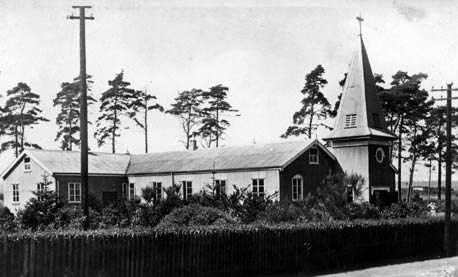 During the building of Bordon Camp, masses for Catholic servicemen were held in a marquee erected on St Lucia Barracks square. This arrangement continued until Guadaloupe Barracks was completed in 1905, when a hut was set aside in the corner of Kildare Close. With the outbreak of the First World War, this hut was required for living accommodation. From then until 1919, masses were celebrated wherever there was a site available, using a portable altar which could be set up in canteens, on the parade or recreation grounds, or even in the Church of England Institute near the Post Office. In 1919 a building, which had been erected during the War as a canteen, was taken over as a church, and this was situated opposite Martinique House. It was named the Sacred Heart Church and was initially heated by solid fuel stoves, followed by electric fires. This wooden hut was demolished in 1990 and a brick church built opposite the top of Chalet Hill.